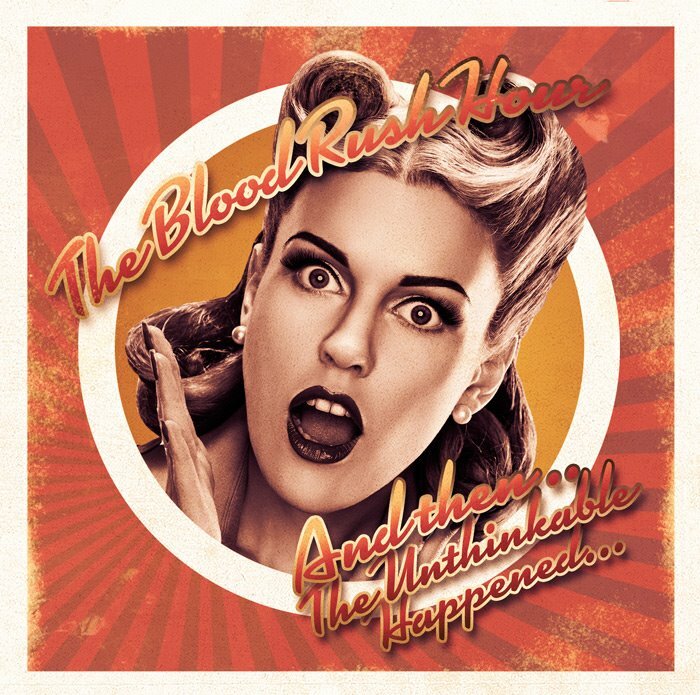 Album Review: The Blood Rush Hour, "And Then ... the Unthinkable Happened ..."
After a year of musical triumphs, this is a perfect way to end 2014. A wonderful mixture of classic sounds, harkening back to the likes of The Beach Boys, The Zombies and early ’70’s brilliance (think Queen before News Of The World, early Sparks or Electric Light Orchestra); this album is chocked full of pure pop with structure and melodic-ism that few can pull off with such ease. This merry band of skilled tunesmiths recorded this instant classic in both Wales and New Jersey and sound like a million dollar effort; this is the kind of album you can sink your teeth into; a rich, exquisite musical cake to savor and then gorge yourself on. Start with the opener “Hello (They’re Coming To Get You)” ad you’re off on a wonderful ride of full-bodied, detailed harmonies; in a word, the perfect introduction for this most amazing of rides. “(The Day I Finally) Stopped The War” is an immediate radio hit – close your eyes and you can hear it coming out of your car radio as you drive down a summer highway – chiming Rickenbacker riffs shine with the near-angelic harmonies and crisp, breezy production that fits. Which is critical – the production of each songs fits the sound; the tone of the individual song, which injects even greater life into the songs. “You Don’t Seem To Wonder Why” goes right into “I See Something” and the two songs blend seamlessly into one another to create a mini-magum opus in several parts – near operatic vocals permeate throughout with the 100-mile-per-hour pace of the two songs. “A Song That Some Sing” is a beautiful, celestial piece with the tenderest of lead vocals by guest singer Christian Phillips, who reaches Carl Wilson-like heights with his gentility (lead vocals are handled on all other tracks by songwriter/multi-instrumentalist/motivator Robert DeStefano); “Ad Astra Per Aspera” is a beautiful, riff-filled mix of whimsy and tongue-in-cheek lyricism and detail with a throwback flute break and “Dancing By Yourself” has a glorious Todd Rundgren-esque arrangement and delivery (“…drink your brandy and NyQuil/And dream of an ersatz lover in a shop-worn peacoat…”). This is not some kind of bluster – this album has it all and every piece is in the right place. This is one of those albums where you sit back after the first listen, say “how did they do that?” and then listen to it again, immediately to try and dissect it. Instead, you give up trying to figure it out and just listen to it again and again and again… The time of The Blood Rush Hour has come. And the unthinkable happened – a band delivered a masterpiece that can’t be argued. And this is a masterpiece.